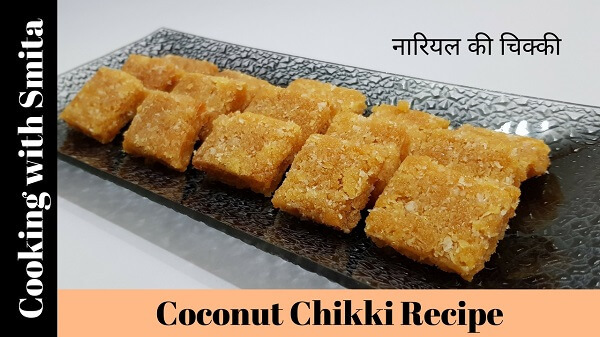 Coconut Chikki, also known as Nariyal ki Chikki (नारियल की चिक्की) in Hindi, is a famous Indian Chikki, specially made on festivals like Makar Sankranti (Kite Festival). It’s made from Desiccated Coconut, Sugar and Clarified butter. Follow this simple and easy recipe to make Coconut Chikki with Sugar at home. Heat Sugar in a pan over low flame. Do not stir until it starts melting. When Sugar starts melting, stir using spatula until it melts completely. It will take around 15 minutes for Sugar to melt completely on low flame. Add 1 tbsp. Clarified butter into melted Sugar. Add Desiccated Coconut, switch off the gas and mix well all the ingredients. Grease a plate with Clarified Butter and pour the Chikki mixture into the dish. Press the mixture using a spatula and spread evenly. 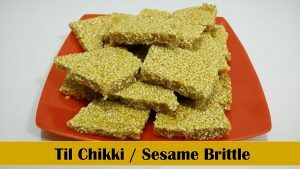 While the Chikki mixture is hot, cut immediately using knife into square pieces, it will help to take out pieces of Coconut Chikki when it cools down completely. Set aside and let it cool down to room temperature. Demould the large Chikki Bar from the plate and break into pieces. Coconut Chikki is Ready to eat. Store in air-tight container for up to 2 weeks.